I love Chinese Food. Period. Its a love that happened only after my wedding and thanks to S, for the number of times he took me out for dinner. Crispy Fried any starter in Chinese food tastes yumm – A punch of garlic, ginger, the fresh spring onions, the color, spiciness – whats not love in it? My recent favorite has been dragon style vegetables, crispy fried. Actually this starter is supposed to be very spicy, but I like it with a tinge of sweetness and tanginess. 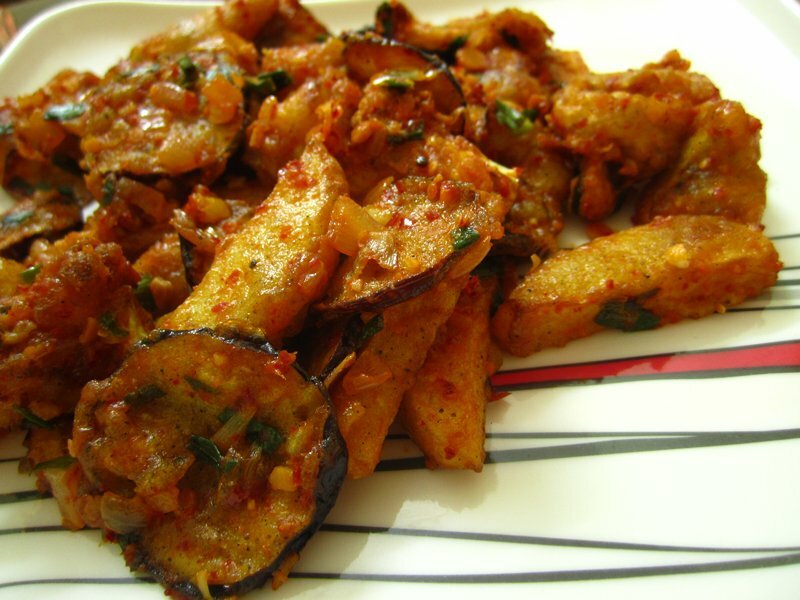 The star of this dish for me is the thin fried brinjal. 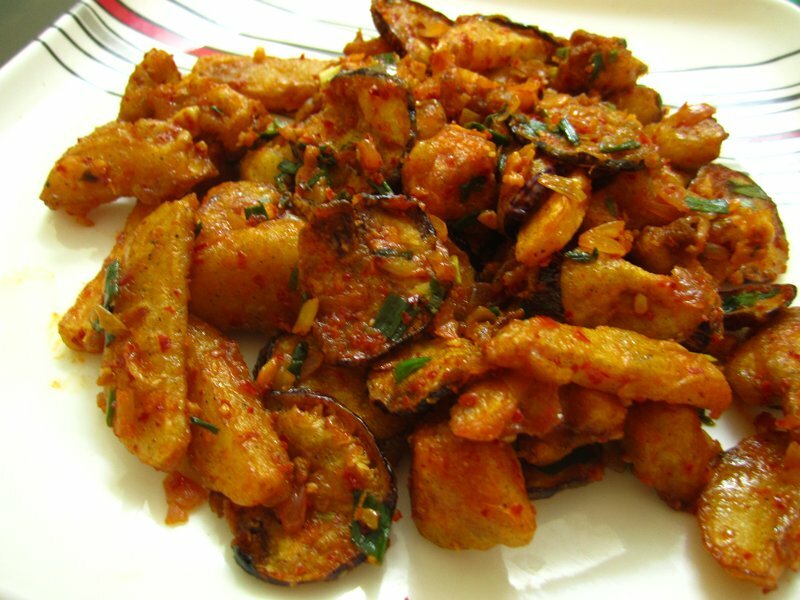 This is one form where brinjal tastes heavenly and then there are other vegetables that bring up the taste too. Today, I made egg fried rice and crispy fried dragon vegetables for lunch and it was a huge hit here. Soak red chillies in little water for 15-20mins. Prepare the vegetables – cut the cauliflower into small florets, potatoes and babycorn into long stripes, brinjals into thin circles (Put the brinjal pieces in water until frying to stop oxidation). In a bowl, mix cornflour, maida, ginger garlic paste, pepper powder, salt, lemon juice/vinegar and mix it with little water to form a thick batter. Keep aside. Meanwhile, heat oil in a kadai. Dip the vegetables into the batter and fry them on medium flame until golden brown and crispy. Blend the red chillies along with garlic pods with lemon juice/vinegar into a smooth paste. Chop onion and spring onions finely. Heat oil in a kadai. Add finely chopped garlic. Fry for 30secs. Add onion and cook until translucent. Add the ground schezwan paste and fry until oil leaves from the sides. Add salt, sugar. Sprinkle spring onions and toss the fried vegetables until the sauce is coated well all over. Serve hot with fried rice or as starter. How are you Arch? Long time no see!